Ready for Spring clean up? It’s time to air out the house and make a list of Spring home improvement projects that will enhance your home. Tops on the list should be the room you use several times a day — the bathroom. And within the bathroom, take a good look at your toilet. Oftentimes people “inherit” the toilets in their house when they move in. Over time though, the toilets may stop functioning as smoothly as they did originally. That’s a sure sign that it’s time for a toilet replacement. Other signs include leaking, rocking or sluggish flushes of the toilet. And, if your water bills seem too high, it’s a good bet that you don’t have a water efficient toilet in your home. Replacing a toilet is a fairly easy DIY project. Start by selecting a low water usage toilet with lots of power. You’ll also want to look for the “cleanest” toilet you can find to make your household chores easier. For peace-of-mind and easy cleaning, we recommend the PROTECTOR® No-Overflow Toilet. It features a unique concealed secondary drain that provides protection from messy overflow situations. The PROTECTOR also stays clean longer than standard toilets. A highly-engineered PuraClean™ glaze on the toilet makes the bowl bacteria resistant and easier to clean. Available as a SmartHeight™ toilet, the 1.6 Gpf PROTECTOR sits 16-1/2″ tall and meets ADA standards, making it easy to sit and stand from this easy-access toilet. 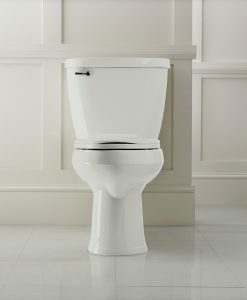 For powerful flush action, the toilet also features a three-inch flush valve design and can easily move 800 grams MaP. For installation instructions for the PROTECTOR, click HERE. And to calculate the water savings this toilet can have on your home bills, see our online Water Savings Calculator.